Mosley Tribes Crane (Matte White) Need Help? Launched in 2005 by Oliver Peoples’ founder and Creative Director Larry Leight, Mosley Tribes blends the timeless luxury traits of Oliver Peoples with a contemporary urban aesthetic. Using durable light weight frame materials and the most advanced hi-tech lenses, the collection perfectly suits the modern active lifestyle. The Mosley Tribes Crane offers an exceptionally nice fit for medium to smaller faces as well as women. 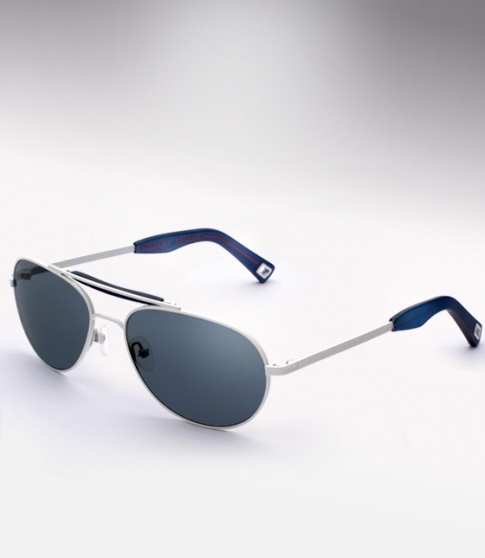 It is offered here in matte white with Indigo Photochomic lenses. Photochromic lenses actually get darker in bright UV/sunlight. This provides for the sharpest vision possible under various light conditions. The most technically advanced lenses for the ultimate in visual performance. Glass Photochromic lenses: color density self adjust(lightens or darkens) depending on the exposure to UV/sunlight for the sharpest vision possible under various light conditions.